We had a great open house last week and truly enjoyed seeing everyone who stopped into our showroom to see first‐hand the newest products we offer and to meet our team! We had so many people ask us about our grey sectional couch that I would like to highlight this piece today. The Grace sofa from Younger Furniture is one of our favorite pieces! They have been proudly crafting American made, high quality, upholstered furniture since 1989. 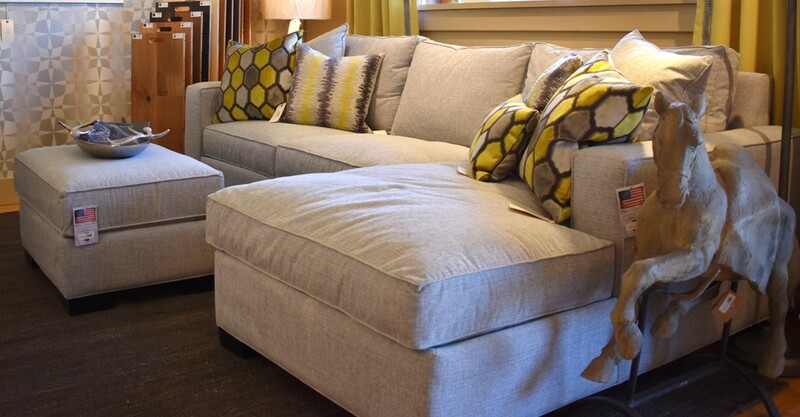 The Grace sectional is a piece that is unbelievably comfortable and you can really sit “in” rather than “on.” If you want to feel like you are resting on a cloud, check out their Feather & Down cushion options. It is the most popular sectional they offer and is versatile so it can work great in just about anyone’s home. Besides the Grace sectional, Young Furniture offers additional sofa/sectionals, beautiful chair and ottomans as well as a stunning Avenue 62 collection which features the vibrant energy of the 1950’s, 60’s and 70’s. But if you don’t find the exact look you want, you can design your own custom couch. You can find the perfect solution for your home by choosing the seating options that best fit your home and lifestyle. Feel free to give us a call or stop by to see for yourself why everyone is talking about the Grace sofa by Younger Furniture!